Now, I know I’ve only had it for a little less than three months, and it’s a bit dinged up already (I should have buffed it up for the photo’s I know), but that only goes to show how good it looks when it’s a bit worn, and how much it can save your pens from incidental marks. 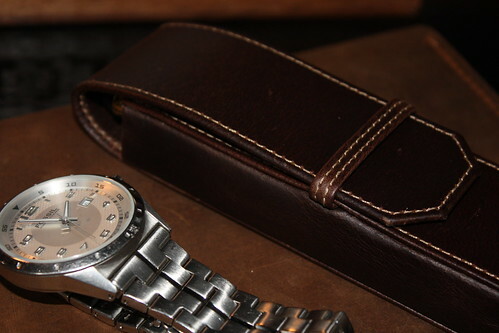 The case is constructed of a tough, dark brown leather that the Franklin Christoph site refers to as FxCel Leather and descibes as, “oil and vegetable tanned” with the “option to rub out marks for a fresh look, even as it ages”. Which I can categorically say is right on the money. This is a high quality product that lives up to its marketing. 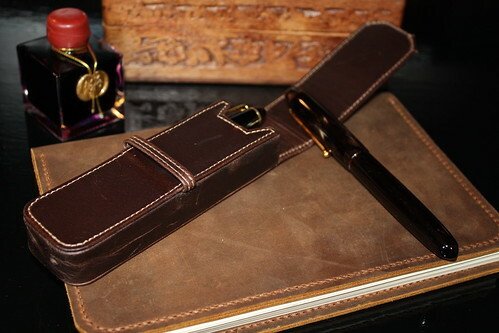 The leather has a nice texture, but is durable and wears extremely well. The Franklin Christoph site is a little conservative on the size of the case, so I’ll give measurements here that I’ve taken with two pens in the case. This has the effect of pushing the flip-over cover of the case up a little, to wrap over the cap of whatever pen you have inside. For this review, I loaded the case with a Sailor 1911L and an Edison Collier, the latter being the longest and widest diameter pen I have available. The case accommodates both with ease. I can see why the Franklin Christoph site lists different measurements, and I can see where those measurements have been take from (mostly internal edges of the case), which makes sense. But I don’t think these measurements really represent the size of the case when it’s closed, and actually contains pens. 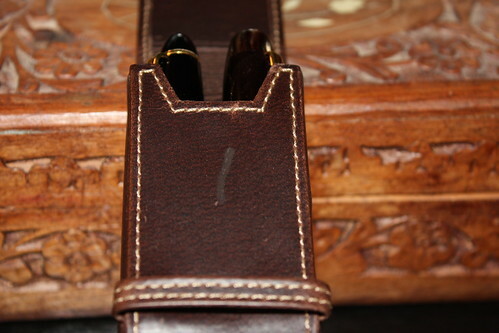 Internally, the 2-pen case contains full-length elasticated loops (meaning they protect the whole length of the pen); which can hold pens up to 17.78mm (0.7in) diameter, and 160.02mm (6.3in) long. Even the Collier had plenty of room to breather. 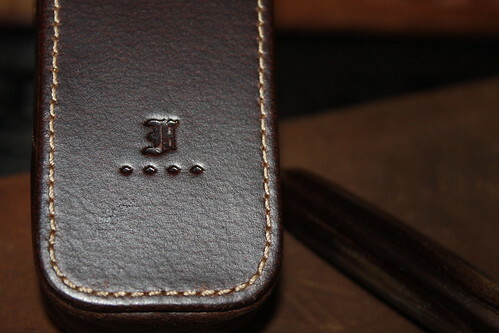 Stitching is tight, and uniform along all parts of the case, and the tasteful embossing of the Franklin Christoph logo appears on the back of the case, near the base. This is a high quality product, and just what you would expect from the Franklin Christoph brand, and at the time I bought mine, The Fountain Pen Hospital offered them at a price I wouldn’t really associate with such a high profile manufacturer.